James Joyce, one of the most influential writers of the 20th Century, was plagued with serious eye problems throughout his life. In 1926 while beginning to recover from his seventh eye operation, Joyce was visiting the studio of his friend Myron Nutting, an American painter who had settled in Paris. To demonstrate the modest return of vision in one of his eyes, Joyce borrowed a black pencil and a piece of paper and proceeded to draw a bowler-hatted caricature of Leopold Bloom, one of the principal characters of his novel Ulysses. 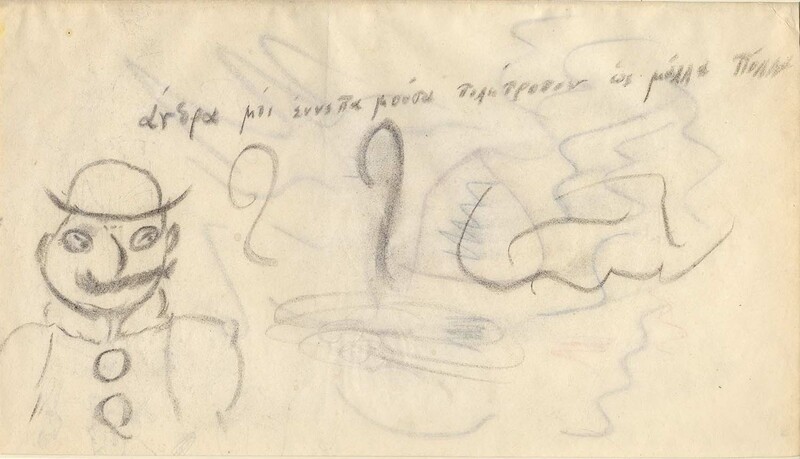 Above the sketch Joyce wrote, in Greek, the first line of Homer’s Odyssey, a work which is of course the chief template of his own modernist masterpiece. In 1960 Joyce biographer Richard Ellmann was an English professor at Northwestern. Ellmann had interviewed Nutting for his Joyce book and helped steer University Librarian Jens Nyholm into the purchase of Nutting’s Joyceana, a collection that included not only this sketch of Bloom, but letters from Joyce and Nutting’s own drawings and paintings of Joyce and his family. Nutting’s oil portraits of James, Nora, and Lucia Joyce now hang in the Nyholm Reading Room of the McCormick Library of Special Collections. Joyce’s sketch of Bloom is not only his only known visual depiction of one his characters, but it is apparently one of the only known drawings by Joyce to be found anywhere. It is a highlight of the McCormick Library’s outstanding collection of 20th century literary material.